"Implement the green strategies outlined in Dan Esty's and Andrew Winston’s bestseller Green to Gold"
Whether you are a climate change skeptic or an environmentalist, sustainability issues cannot be ignored in today’s corporate world. With rising energy and natural resource costs, intensified regulations, investor pressures, and a growing demand for environmentally friendly products, sustainability is no longer an option—it’s a business imperative. Unlike many green business books, the Playbook skips the environmental ideology and deals exclusively with tools and strategies that have been shown to cut costs, reduce risks, drive revenues, and build brand identity. Builds on Dan Esty and Andrew Winston’s prizewinning Green to Gold, which has become a business classic and a staple of management training across the world. 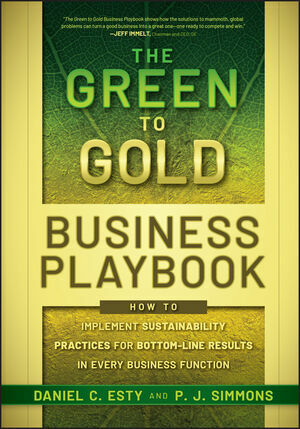 The Green to Gold Business Playbook gives you the tools to make green work-and work profitably-for your business.